I just commited the new menu "system" in edelib trunk (actually, it is not really new, but forked FLTK menu code). FLTK menus are fine, fast and works well. But there are few missing pieces, like custom icons in menu items. Actually, you can set an icon, but menu item label will not be shown, since that icon will be considered as label. Strange decision. Also, setting icons with custom sizes is not possible. On other hand, extending menu code in FLTK is pretty impossible. One of the most important part of FLTK menus, Fl_Menu_Item, can't be inherited to allow custom item draws, so if do you even the smallest change in this class, you'll have to pull all Fl_Menu_* code and change it to use your Fl_Menu_Item modification. Pretty scary, isn't. So, you know why it is forked :). Also, this is not the only reason. With this comes greater flexibility in future extending, adding custom drawing effects, improve scheming ability or similar things. 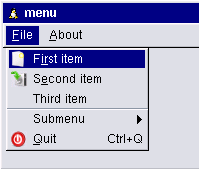 Besides, I planned to use them for ede-panel, and these menus has to be little bit "more" than plain FLTK menus. I know, nothing fancy and looks like menus in any other toolkit. And that is the point :). Also, icons with different sizes can be used, aligning their labels nicely. It doesn't look pretty and hardly anyone will use icons with non-uniform sizes, but follows FLTK way where each menu item could have different label size, font or color. Contrary to Qt style (where you always have gap from the left size, no matter was icon used or not in the menu item), I took Gtk approach: if there is no icon, there will be no gap (like it is shown in above submenu). This gives some kind of FLTK "compatible" feeling. Application code should not be changed considerably either. 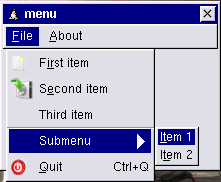 Instead Fl_Menu_Item or Fl_Menu_Bar, putting edelib::MenuItem or edelib::MenuBar will do the job allowing to use FLUID generated menus without much of the trouble.